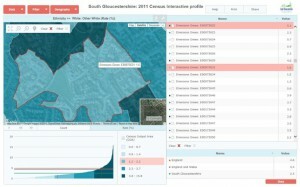 These profiles combine data, graphics and maps to give an interactive statistical overview of neighbourhoods in South Gloucestershire. The profiles can be used for a wide range of purposes, including for example providing evidence to support funding bids. Data in these profiles are available at a range of different geographical resolutions (depending on the dataset). Data for comparison areas are also provided where possible. There is a summary guide on how to use the profiles or you can contact us for further information. These profiles enable you to view a wide range of data related to; population, identity and ethnicity, health & care, employment & economic activity, and housing & accommodation. 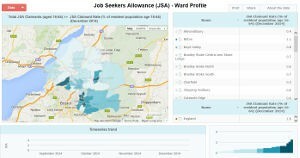 These profiles enable you to see how the JSA rate (and Count) varies across South Gloucestershire. Data is updated on a monthly basis enabling change over time to be seen. Please note that the claimant count is not the official unemployment rate, but it provides the most detailed and regularly updated source of unemployment data at local level.